Made in Mars, Grounded in L.A.
Our 44-Inch Artisan Super Longboard with beautiful Bamboo and Maple deck, original abstract graphics, rugged aluminum trucks and durable 70mm PU wheels. This classic Bamboo Longboard Skateboard will take you where you need to go in style. It’s great for around town, getting to class or cruising along the boardwalk. Top quality components ensure maximum durability and optimal performance. Life is a Quest, enjoy the ride. Made in Mars is a rethinking of what a board sports company is all about. Due to our “alien” company culture, we embraced the “Made in Mars” name. Looking around we saw a lot of companies in our Biz, many that were doing a good, and sometimes even a great job at making boards and trying to fit into the “Action Sports lifestyle”. This was all great, but it just wasn’t for us. We design and make our own product, so we know what we are asking you to spend your money on. Next we wanted to offer the best of the tradition brands, and by working with some of the real pioneers of the Skateboard, Surf and Snow Board world, help reinvent them using today’s best components, great fresh art and new technology. We also dreamed up a couple of brand new initiatives, because one size never fits all. We did all this, keeping better components and the highest quality. Trust us that isn’t easy and definitely makes for some long days. 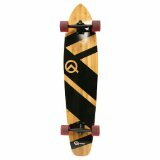 This entry was posted in Best Seller, Most Wished, Top Rated and tagged Bamboo Longboard Skateboard, Bamboo Skateboard, Longboard Skateboard. Bookmark the permalink.